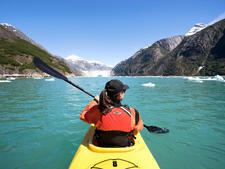 Seward is a picturesque harbor town sporting the catchy motto "Alaska starts here." 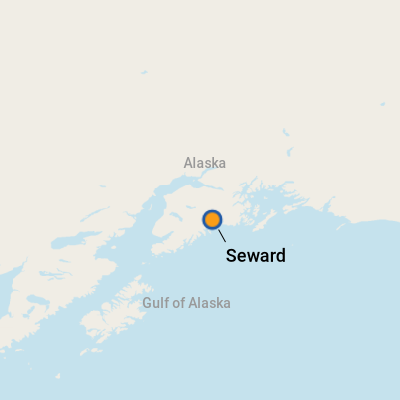 What that means is that Seward really is the gateway to the Kenai Fjords National Park, a vast treasure trove of marine life. It's the launching point for kayaking and fishing adventures. And it's the start (or end) of the Alaska Railroad and the historic start of the famous Iditarod sled dog race. You'll find Seward about 125 miles south of Anchorage on the Kenai Peninsula and standing at the head of Resurrection Bay. For most cruisers, it's an embarkation or disembarkation port (but there's plenty of ways to spend your time with one day in Seward). 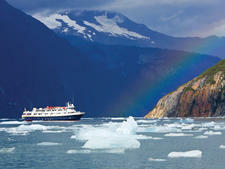 You'll likely fly into Anchorage to meet your ship, or arrive in port after a cruise tour to Denali. 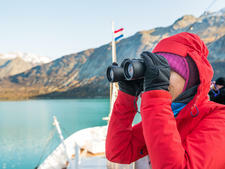 True, the port of Whittier is closer to Anchorage and is challenging Seward for cruise traffic, but there's no comparison when it comes to sightseeing, staying and playing. More than a quick port stop or mere point of embarkation, Seward makes a handy, not to mention charming, base for exploring the peninsula and its quirky small towns. It's well worth spending two or three days poking around this area. It offers a taste of the best of what you've come up north to experience -- calving glaciers, gorgeous fjords, wildlife spotting on land and sea, husky dogs and the great outdoors. If you're into fishing, casting for salmon doesn't get any better than on the Kenai River. You can drive to Kenai to browse through the galleries and shops. Soldotna is home to Kenai River Brewing Company. Artsy Homer is doable in a long day. Seward was named for President Lincoln's secretary of state, William H. Seward, the main man in negotiating the purchase of Alaska from Russia in 1867. Not everyone was happy about the deal. Some dubbed it "Seward's folly." The city was founded in 1903, thanks to its envious position as a year-round ice-free harbor. It is well situated for transporting freight arriving by rail from the interior. It was (and still is) the end of the line for the Alaska Railroad, which is currently considering plans to move the tracks even closer to the cruise terminal. That's good news for cruisers. You can easily get there from the Anchorage airport by more ways than one. 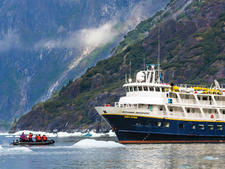 If your ship embarks in Seward, you'll likely have a group transfer to the port by motor coach. Independent travelers can make arrangements to get to Seward the same way or they can come by train. If you want to drive, one-way Hertz rental cars are available for the pretty, two-and-a-half-hour road trip from or to Anchorage. Cruise ships dock at the north end of town on Port Avenue. The Small Boat Harbor where Kenai Fjords tour boats depart is less than a mile's walk south. The downtown area is roughly another mile further down the road. There's not much happening right at the cruise dock. But you'll find everything -- shops, restaurants, tourist information and tours -- at the Small Boat Harbor. Getting seasick on small boat tours around the islets and inlets of Kenai Fjords National Park. Most operators provide meds if you feel queasy, however be aware the pills may put you to sleep, and you might have to forgo a little glacier viewing to spite the nausea. It helps to watch what you eat and spend some time outside in the fresh air. But if you aren't sure, be certain to take the pills at least a half-hour to an hour before your boat departs the harbor, just to be safe. On Foot: The two main walking areas are the historic downtown and the Small Boat Harbor. 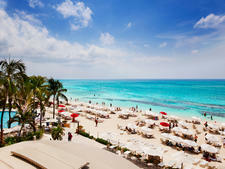 They are within a mile of each other, and both have souvenir shops and cafes. Fourth Avenue is considered "downtown." By Shuttle: A free shuttle bus runs from the cruise dock to the tour boat docks, Alaska SeaLife Center and downtown (although cash tips are recommended). It's available daily, from 8 a.m. to 7 p.m. The schedule is posted in various shop and cafe windows. By Car: Taxis gather near the cruise dock or can be flagged down in town. However, there are only a dozen or so in service. For car rentals, call Hertz (907-224-4378; 600 Port Avenue). U.S. dollar. ATMs are available in banks and at Safeway, the local grocery store. English is spoken in Seward. Eating out in Seward is a casual affair and unsurprisingly centered around fish, although plenty of inventive options are being introduced with relative newcomers to the area. Look for the daily fish and seafood specials on the chalkboard of your chosen lunch spot. Restaurants are scattered around town, but you should be able to get to most of them by foot or free shuttles. If you imbibe, beer and cocktails here are given just about as much attention as the food; to spectacular results. For adults, yummy salmon you've caught yourself, had processed, packed up and shipped home and for the kids, a cuddly toy sea otter from the Alaska SeaLife Center.